Prisoner was adapted from a true story, the account of a Japanese man arrested in Cambodia, protagonist of Sawai Kujira's Prisoner in Phnom Penh. The location changed to an imaginary island in Southeast Asia (shoot was in Thailand), but the rest remains more or less the same. Going to Seraivia to meet old senpai Yuzurihara (Nakamura Shunsuke), Izawa Keigo (Tamayama Tetsuji) finds himself involved in more than he could ever expect. He quickly learns there's no law you can't bend with a few good dead presidents, and that embassies only work as long as you don't become a burden to them. 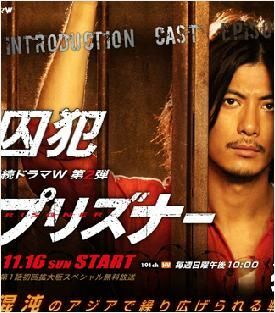 Following a man who conned his friend, Keigo finds himself in prison, with a 10 year sentence and seemingly no way to escape, although he does find a friend in the ambiguous Pon (Ohmori Nao, his first drama appearance in two years). Real estate intrigues, corrupt police, a mounting death toll and the tasty decadence of a banana (or... well, pineapple) republic. That's Seraivia for you.